Welcome to Red Couch Recipes and to Tablescape Thursday where Zoulah and Beaulah Boulah got together for a luncheon at my house and lots more fun! What fun those girls had at their luncheon and the biggest news around is that Zoulah has LEGS!!! Jacqueline, brought LEGS for Zoulah (a.k.a. 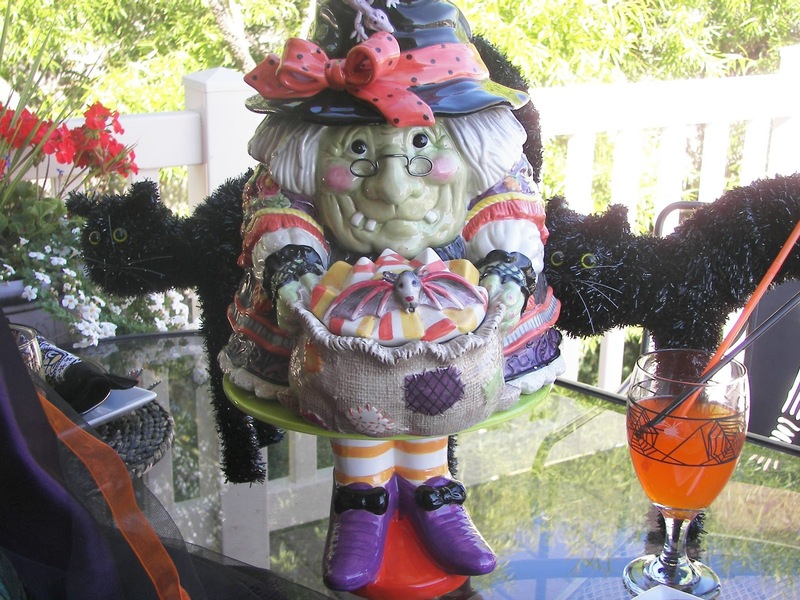 a Halloween cakestand). Zoulah is so thrilled with her legs; she can stand nice and tall. In a later post, I will show pictures from a photo shoot Jacqueline and I took while Zoulah and Beaulah took on a walk in our back yard. 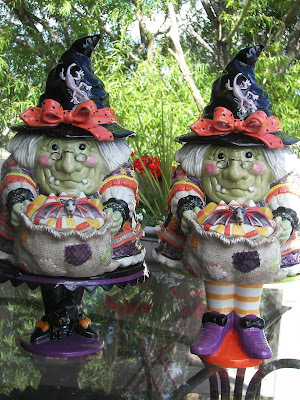 A picture of the twins on my back deck -- they smiled so prettily for the camera. Beaulah wanted to take her glasses off for the picture -- she's a little bit of a vain witch. Since Zoulah resides at Red Couch Recipes, she got to be the centerpieces for the Halloween luncheon she shared with her sister Beaulah. Beaulah was NOT very happy! This is the simple placesetting that Zoulah chose to entertain her sister "B" with. Zoulah crushes on green and black at Halloween. 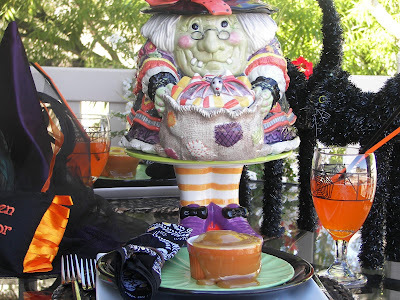 She served this spice cake draped with a rum caramel sauce to Beaulah. Beaulah, like her owner Jacqueline has a sweet tooth. Beaulah ate TWO! Of course Zoulah is sharing her recipe soon, maybe for Foodie Friday. 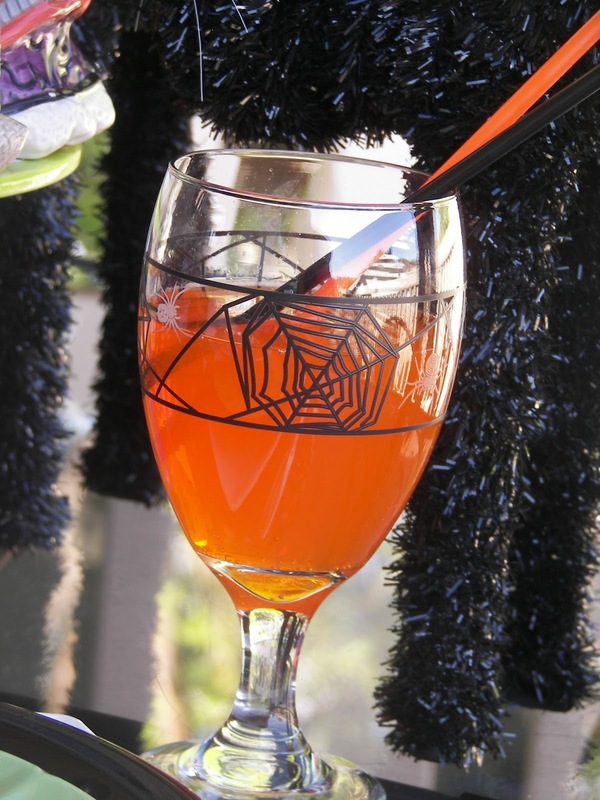 The twins love to drink with these spider goblets. Orange soda is their favorite Halloween drink -- none of the hard stuff for both of the girls. Looks like one of the little naughty gals has been slurping some pop! 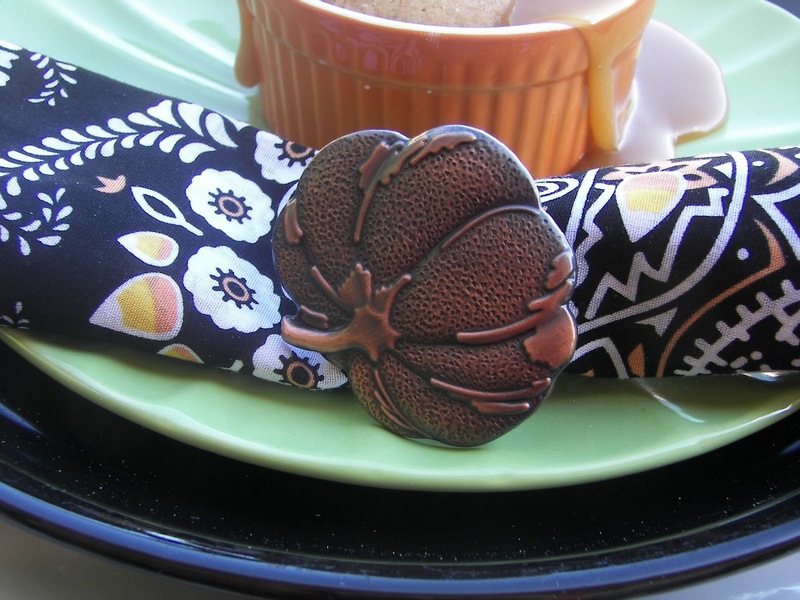 Zoulah loves the candy corn bandanas to spice up a Halloween Table. Natch, candy corn is a favorite for her. 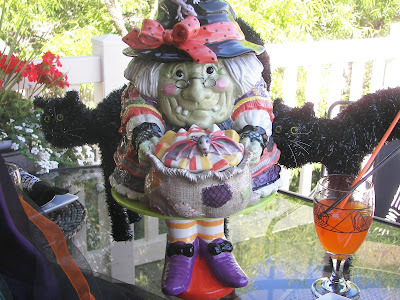 Zoulah's pets Fright and Night -- both friendly Halloween cats -- keep company at the table. Zoulah wanted her fancy hat on the table -- of course she likes fancy things -- she's like that, you know. The answer to the question is that, of course, Zoulah and Beaulah are always GOOD WITCHES! Did you doubt??? Zoulah thanks you for dropping by Red Couch Recipes and sharing the luncheon that she had with her sister. Glad to see both gals up and walking! Your placesetting and cake both look delicious! I'm visiting from Tablescape Thursday. 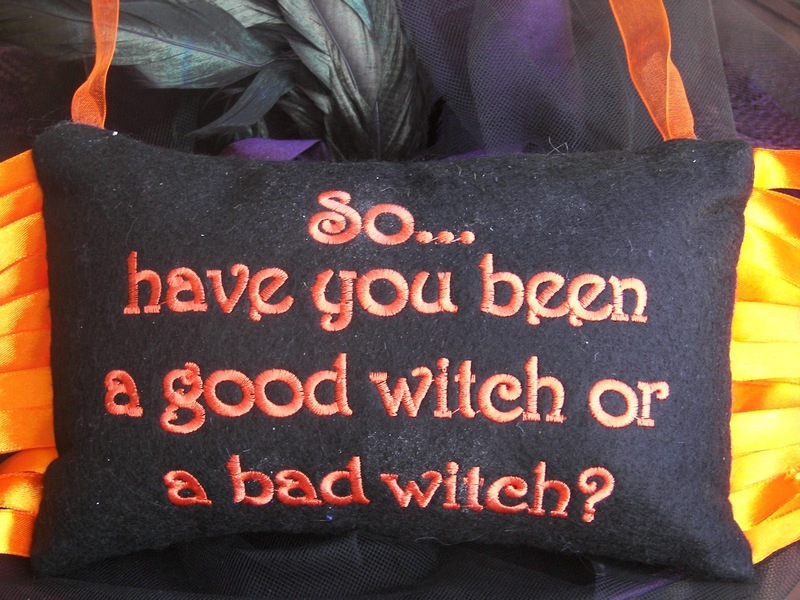 Well, since I just saw "Wicked" last weekend, I will say that they are BOTH good witches. This is so cute! I'm also waiting for the recipe for the spice cake. Those girls - what an ad for the advantages of sisterhood! Too cute with the new legs -- all decked out with their holiday stockings! 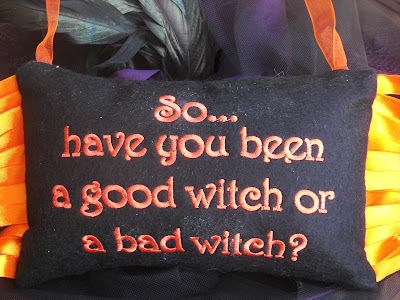 Your little pillow reminded me of the day my daughter (about age 3) asked me if I was the "nice mommy or the witch mommy today?" I had to laugh. You have the best witches girls could ask for!! Love the legs. This is a great post and an adorable table. "Pointed" hats off to you!! Great presentation on the spice cake, Joni! 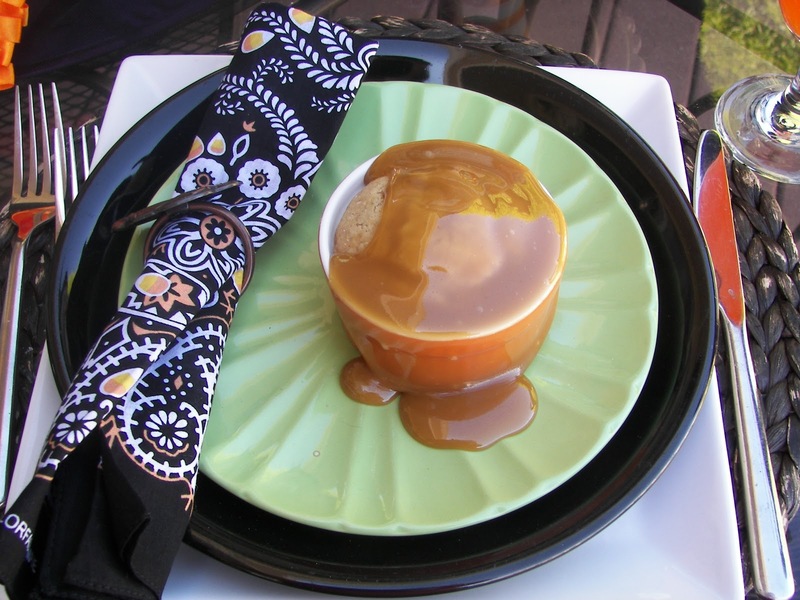 I love the way you allowed the caramel sauce to gracefully puddle around it. That is restaurant quality, my friend! 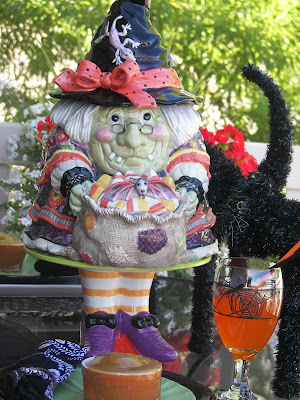 You & Jacqueline (and Beaulah and Zoulah) are rarin' and ready for Halloween!!! Great post! Boy those girls have some fab gams don't they? Great idea and what a super cute cake plate! I'll bet a great time was had by all! 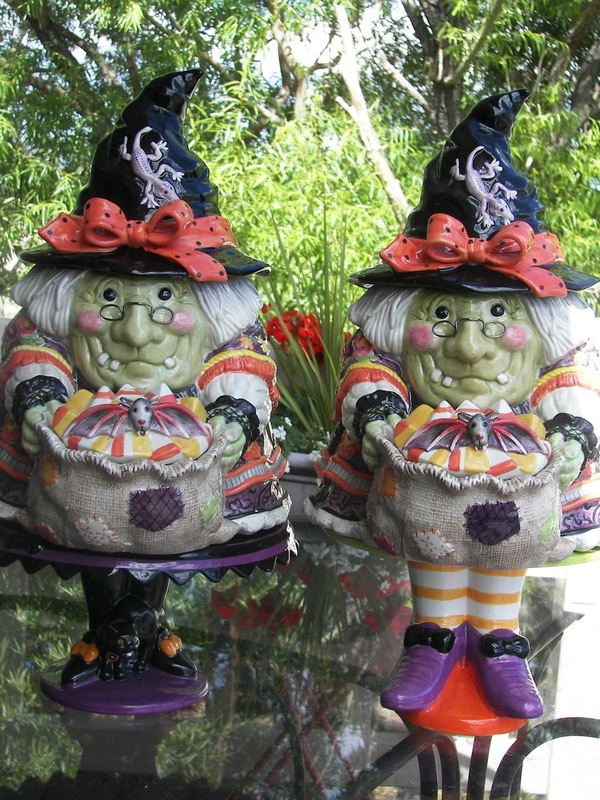 Zoulah and Beulah are the cutest little witches...I bet lunch with them is a blast! It all looks wonderful. 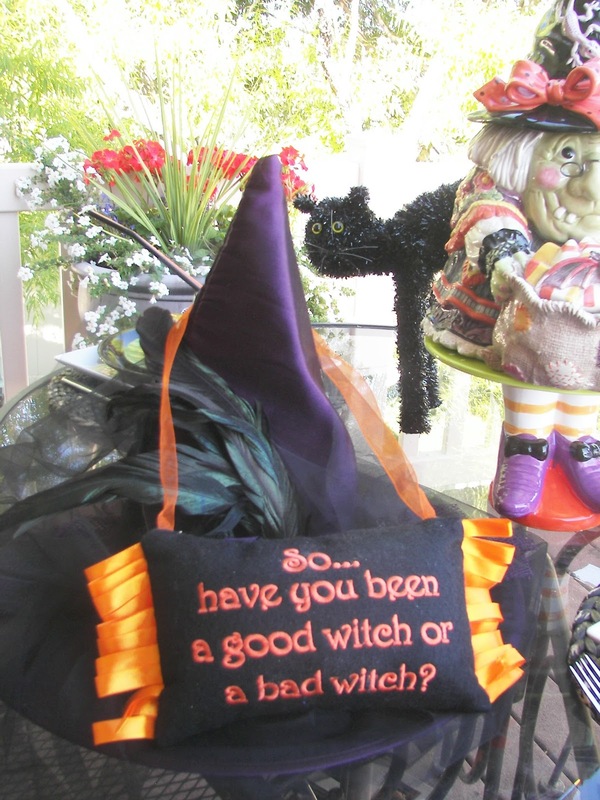 I can tell the witchy girls are going to having big fun all month! How wonderful that Zoulah has found some legs! But I do want to say that it is not nice to count other's servings or calories. C'mom girls, lets all get along! Your party looks delicious! I've been too busy to visit and now I see the twin witch sisters have taken over! You are so lucky to have a sister to blog with, so much fun! This is too cute Joni, but my mouth is watering for that caramel topped cake...can't wait for that recipe. Such a cute tablescape and a nice sister. Those are some cute legs. You girls do know how to have a good time. Love seeing your creative tables.